I expected this game to be a total joke-- which isn't really a bad thing-- and to be fair it had its share of ridiculous antics and stupid humor, but... I was surprised by the amount of emotional depth and realism present in a game set in the land of Pastry and Pottery Gods. This is probably the first dating sim I've played with interactions between characters that really felt alive. It's probably greatly helped by what others have already pointed out: Ginger is a fully fleshed out, unique person. The rest of this review contains SPOILERS so anyone stumbling through the comments before playing should really just stop now and enjoy being caught off guard by what this game has to offer! Absolutely! This game had me tearing up at some points/really thinking about my actions, and laughing like an idiot at others. It's so strange to think that a game can have Benjamin crying over old pages of your diary, telling you he never wants to see you again, since it's clear you've only been using him since the start... and also have Carver dressing up as an old woman and stealing your shoes. I knew it was him! Wait why did he do that though? Like sure, yeah, crossdress for discounts... but why did he steal Ginger's shoes!? The mysteries of Carver are unrivaled. The complexity Ginger shows in each route is incredible. Coming to terms with her jealousy and feelings of inadequacy in Carver's, realizing that she wouldn't have helped Benjamin if he had come to her two months earlier and feeling that shame that only a previously ignorant and self-absorbed person can feel, knowing inside that using Radley was wrong even when he tells her he knows and he's alright with it, and trying to cope with the guilt of it however she can. I also love how she literally forgets the festival in every freaking route. And the boys are just as human-- er, elven... and charming to boot! Benjamin's trust issues, his attempts to cut himself off from his emotions, and his ability to decide someone's character and tell them off or thank them accordingly, paired with his strange interests and his lack of understanding of basic social customs as he interacts with an unfamiliar culture, makes for a very endearing character. I love how his sheep went from a funny joke to something serious, too. His only friends from back home, and an incredible comfort to both Ginger and Carver in the pink midget's route. Releasing them in Radley's route was genuinely painful. Benjamin is also just... really sincere. To quote (or rather paraphrase) him, "I'd rather say what I think then not and regret it later." Likewise, Radley's quirks and traits won me over quite thoroughly. I usually love best friend types, but Radley's first prank annoyed the heck out of me right off the bat. His pranks aren't funny. Like, at all. But he makes up for that somehow, and that just makes me like the good in him even more. His feelings for Ginger (and how he deals with them) provide a good insight into who he is as a person. He likes Ginger because she's bold and takes things into her own hands, unlike him with his indirect approach to life, and wants her to make a move. His jealousy in other routes is both very interesting and heartbreaking. He supports her, but feels incredibly dissatisfied-- and everyone in town can sense it but Ginger herself, the fool. Ginger's line, "What would Radley know about the pain of unrequited love?" really hit hard. What would you know about it, Ginger? Man, when he said, "No one could hate you, Ginger," something in my heart died a little. I love that he sings. It's such a small detail, but really brings him to life. I think my favorite thing about Radley is that he's the first "best friend" I've seen in a dating sim that, you know, is actually present in the protagonist's life in the way best friends are. I saved his route for last, but got plenty of Radley content in the other two routes and had already grown fond of him by the time I got to actually dating him. Him being a germaphobe is also very unique and distinct to Radley. Makes him memorable. And Carver... oh Carver, I will speak about later. Just you wait. God, it's really hard to say. Maybe when you choose to tell Radley you really like Carver, and he smiles at you to hide his pain and says, "Oh. I'm not sure I can help you with that." Perhaps when Carver's jealousy has him putting up his walls again, and you get so ticked off at what seems like a regression in your progress that you start that huge argument in which you both use each other's insecurities against each other until it ends in a flaming declaration of, "Everyone hates you! I hate you!" and a subdued, "I was stupid to think this could ever work." Or could it be when Benjamin tells you that your lack of sympathy to his refusal to date you only proves that agreeing would be a bad move on his part? Nah, it's definitely when you try to flaunt your legs and fall in a puddle of mud and Benjamin's like, "Dude, you gotta leave." Or when you practice pickup lines with Radley to prepare to woo Carver. I changed Ginger's name, admittedly, to Saffron. Saffy for short. At some points she would still be referred to as Ginger or Ging or even Ginger-ewe. I also found that when you rush to help Radley when he slips in the mud, the bad ending doesn't happen. It mistakenly redirects you into asking him to shower at your place. I also thought the point system for getting a good ending was a little unclear. Other than these technicalities, I was very happy with everything. Oh, Carver, my dear sweet Carver. I can't tell you how much I adore him. I immediately knew that I would. When Ginger stood before her town and said that he's lovely and not annoying and she would cook anyone who said otherwise (who wasn't her) into her next baked good... yeah that's about how I feel about Carver. Lowkey when the grandma and the mayor gave him busywork to get rid of him in Radley's route I was filled with some genuine rage and sadness. Courting Carver was a real journey of an experience. He was the first I went for, and I don't regret it. Everything about that route was so good!! His definite flight reaction to Ginger's "weird behavior" was adorable omg. The food fight was my jam. When he came over early after Ginger had been dying waiting all day, it was so akin to the feeling of real life relief when someone's been missing you too. The argument, as I've mentioned, really made me take the game seriously. His haunted expression will stick with me for life. It was like everything just stopped in place as Ginger dropped her bowl. I loved his relationship with Benjamin. I loved how when it comes to telling him about Heartbaked, there was no avoiding it, was no better choice than the truth. How he took it, man. I felt so terrible. Oh my god-- him confessing to pinning a crime on Radley was beautiful,, I love how each route makes a case for the other boys. I wanted to pursue all of them by the end of Carver's route, which is a great feat. Carver's ending. "You have a long time to make me love you." Ugh. I love this boy. This has definitely gotten me into a creative mood, and I'll be drawing up fan art and writing stories with these characters for sure. I really want to explore the relationships between all the boys and maybe go for a big messy poly relationship in a fanfic lol. I just hate when I can't make everyone happy together, especially when I feel like it could work! Thank you for this piece of art. I'll be checking out your other games. Gourmet Visual is no longer together, but if you'd like to see more games from myself and one of the other writers/the artist, you can find us here at Fablesoft Studios! Again, thank you so much. The game had such pretty, soothing music (new study music, wooh!) and adorable graphics/illustrations. I supremely loved Radley, he's such a cinnamaroll! I took his route, but sadly got ending 5~ so there wasn't any cute, happy ending. Not sure how to be with Radley, definitely wish there was more development to that (at least seeing the results of the competition/festival and finding out what happens to Radley in ending 5, since it seems like he's waiting still outside the door; - ;). It would be really nice if there were more options for the player to make (though I understand that would make the game much more complex). Overall a cute game. So far I've been really enjoying the game, however I may be experiencing difficulties. The game could be having issues because for Carver I keep ending up with ending # 9 for all the choices. I will try to re-download the game and maybe that will help. Just maybe. Still, thank you for this amazing game! Edit: It works now, hooray! It's not opening on my Mac, and its not the "security and privacy" thing either. I've tried moving .app to Application folder and back and it started working. Maybe also "Show package content" on .app and running the executive file can help. I often encounter issues running games for Mac. So I usually end up playing the PC version with Terminal. This game was sooooooo adorable. The characters design is really pretty and its very well written. Thank you for this game. Radley route is the best and it made laugh and smile so much ! Hi sorry! Gourmet Visual isn't really a thing anymore, so the e-mail's gone down. I don't think anyone will mind if you make a translation though! Feel free. Go ahead! A few lets plays of this have already been made, so I'm sure no one will mind. Loved this game soo much, laughed till I lost my voice. Probably one of the funniest otomes i've ever played. All the guys are soooo likable, especially Radley he's a special germaphobic cinnamon roll. Made me laugh so hard ,i've finally found someone who bathes longer then me. Ginger was also hilarious , her commentary was epic. This was one of the very first games I played on this platform.. I think it's freaking adorable, in terms of story, art and characters. Aand.. of course I had to fall for the jerk. I have absolutely no regrets. I'm definitely gonna play this again some time. This was such a cute game! I've only played Carver's path so far, but I really enjoyed it. Also, the pastry-related puns? So funny & added a nice personal touch to game, ahaha. i cant seem to play the game! HELP! This game is listed as an android game, but how exactly do you get it to work? I bought this specifically to play on my phone, and as far as I can see, I can't. Can`t open or extract the zip file. It`s "invalid". I want to play it so badly! - Any other random comments! I'm still playing it. In fact I oly discovered it now. But I came to say that I LOVE Carver best, I kew I would, i picked himoff te bat expecting good things and I wasn;t dissapointed! the banter s very good :) and i just love how authentic it feels, the writing captures an authentic development of feelings between them whilst keeps the banter- I love that! Carver's a character but he has uderlying genuiness from the strt and I love hw your writing captures that, between the lines! And I love Ginger ad Carver together? :D I like the writing, it has lightness to it but feelings are genuine and believeable. Very entertaiing. And i swear i love Carver. Made me feel all tingly. They are phenomenal together! Awesome! - What parts could be improved upon? There were a few spelling/grammar errors, but nothing major. - Who was your favorite character? I've only finished Radley's route, so Radley so far. Might change after I play the other routes. - Would you like to see more games from Gourmet Visual? YES! - Any other random comments! I love the world you guys created, I'd love to see more stories taking place in this sweet based world. I also love the art style. Did you enjoy it overall? I've got plenty of things to say and ask that I'd rather do personally or in a chat with the game creator but oh, well. Guess the comment section will suffice. Yes, I highly enjoyed the game and it's one of the few visual novels where I wished to go through all of the endings, not just the good ones! I'd even go as far as add it to my top 5 completely free PC otome games or at least number 6 or 7. I can really go on and on about what I loved about Hearbaked but like it says I can only list my favorite parts. What surprised me the most was that despite being made in one month neither the endings nor the game as a whole felt rushed. Just like the characters I also doubted two people can fall in love with each other in just 10 days but damn, Heartbaked made it seem plausible! We had enough time to get to know the characters, get attached to them, get heartbroken [sometimes twice in a route] and later on feel relief. I think the pacing couldn't get any more perfect than it already is! I immensly appreicate the amount of effort that went into details when it comes to backgrounds, menu designs, the diary having notes and scribbles like a real diary and certainly the dialogue. I was prepared to go all Cinema sins on tiny plot holes but there were surprisingly very few of them. Let's get back to the character topic. What would a main character be without a personality? [Unfortunately, we see that frequently, especially in mobile otome games] I honestly did not notice each dialogue/action choice always had a volatile, a gentle and a sassy option since in the end they all seemed like traits of the same person. That just means Ginger is as complex as a real human. Even if I didn't constantly choose the same kind of answers it would seem like something Ginger would do. Usually I find "pick your personality along the way" kind of games very risky to be made because eventually you're forced to stick with one type of behavior otherwise the protagonist's actions would look inconsistent. Here the balance was flawless. The love interests were just as colorful and fun as the protag while still being able to show their life has their fair amount of drama. It's difficult, especially in a short amount of time to make the player seriously care about what a character is going through but here I ended up caring for everyone by the end of a single route. Now that's what I call well-written characters! What parts could be improved upon? I don't have many problems with the game so I'll just go all out. The few grammer mistakes don't bother me as much as the overuse of CAPITAL LETTERS in Benjamin's route. Was his route created first and then the writer realised they should cut down on the Caps lock? I find it a tad jarring how people supposedly changed clothes yet they didn't in the sprite. It just heavily breaks the immersion. Another nitpick is that I never understood if the buildings, trees, fountains etc. were actually edible or they just looked that way. It may seem trivial but to me it's pretty darn important if one is gonna go the "we love sweets so much we live inside them" road. If everything is indeed made out of candy countless problems with realism will arise. Then again, I am playing a dating sim about a cake needing love in order to be completed. Pretty much all side-stories in Heartbaked are explored as much as they need to be but I'd really would have liked to see more of the relantionship between Ginger, Radley and Carver. It was said that they all used to train under the girl's Grandma so that means they most likely all got along at one point yet they ended up as enemies. Was it just because Carver sometimes acts arrogant that the three kids grew apart? I imagine both boys stayed by Ginger's side when her grandma died and put aside their difference for a while. I'm just saying it would have been nice to see such a subplot in order to further shape the characters. By far it's Carver because in a genius way he slowly and smoothly yet in a short span of time metamorphosed from a funny scumbag into a lovable goof. One can see his route is about changing for the better but if we look at it reasonably a person cannot change completely in those 10 days. If that were to happen the story would suffer and even more in Carver's case since his main trait is acting snarky. The writer knew that and instead just showed new sides to him which would appear more and more often with time. The only thing that changed was our opinion of the character since we would eventually accept him for who he is. Would you like to see more games from Gourmet Visual? Yes with both hands raised! For sure whatever content comes from GourmetVisual it would be top quality! 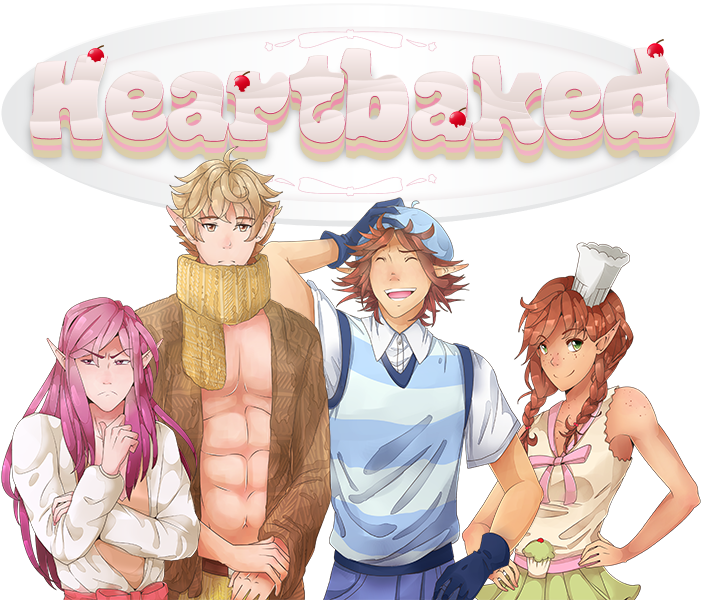 I'd even love to see a sequel to Heartbaked which can end with the couple finally being able to make that damn love cake! Yes, I definitely enjoyed this game, I attempted to get every ending; even the bad ones! lol. Love all these characters, they're all very unique. I really enjoyed Ginger's inner thoughts and her attempts at flirting. I also love how dynamic and different each male counterpart was. They're all very good story lines. I noticed some spelling errors and I couldn't get ending #4 even though I did what the guide said to. I loved Ginger(Great lead!) and my favorite guy was probably Radley, but i'm a sucker for childhood best friends ending up together, lol! Yes! I'm about to play C&C right now! I really like the animation style you went with, dialogue was nice,the overall universe you created was adorable and the way you made it so clear Radley loved Ginger in every story was so perfect yet heartbreaking! i downloaded the game from the apple store and i enjoyed it a lot!! the routes and characters were really sweet and cute~ my favorite route will be Carver's,, he's such a cute lil sour pumpkin XD i hope to see more of your games!! I went into this game with low expectations; safe to say, you have definitely surpassed them by a mile. Yes, I definitely did. There didn't seem to be very many formidable visual novels floating around Lemmasoft this year, however I'm glad to have found this. This Nanoreno is brilliant with a very well developed story line, I'm extremely impressed at the capability of you guys to develop this in a single month. The music and art were adorable, and matched each other perfectly; also, the writing was simple and could get to be very moving at times. My favorite part was how perfectly everything fit together in Carver's path. Lovely job! Probably the best Nanoreno I've ever played. A pretty impressive feat, considering i've played over 50. Absolutely loved this game. All the characters were quirky, and there were a lot of hilarious parts. Oh, and second-hand embarrassment from Ginger's attempts at flirting. Hilarious, but made me cringe at times, and I guess that's exactly the point, haha. It was also hard to watch Ginger being mean to Benjamin, especially after playing his route and understanding him better. And then watching him leaving her store all dejected made me want to cry. And then Carver. Dear Lord it was difficult to watch Ginger and Carver spout hateful words to each other when Ginger blurted out something mean to him, and he said something meaner back. Despite being short, it can be funny, sweet, and heartbreaking all in one playthrough, and I think that's a good job. One thing I do have to mention, I cannot for the life of me get Ending #4 in Radley's route. I even followed the guide, but every time I pick the "help him" option it always continues on, unlike the other bad endings, and I would always end up with Ending #5 instead. Hello can i upload my gameplay of this game on youtube,im starting my chanel and i saw a lot of people playing this game,ill put ur credits in the desriprtion?